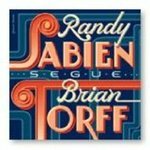 "Segue (CD)" by Randy Sabien, Brian Q. Torff et al. Brian Torff is responsible for four of the compositions and is the bassist on this CD. Recorded at Studio M, Minneapolis Public Radio, St. Paul MN, March 14, 2002. Minor thing / Randy Sabien, Mike Dowling (5:49) -- Manhattan hoedown / Brian Torff (6:15) -- Anouman/Daphne / Jean Reinhardt (4:20) -- Gypsy medley / David Grisman (4:26) -- While my guitar gently weeps / George Harrison (3:26) -- Star of India / Brian Torff (2:28) -- JD meets the rhythm section / Randy Sabien (3:03) -- Disco Dean / Randy Sabien (4:43) -- The sound of fish dreaming / Randy Sabien (3:48) -- Starthrower / Brian Torff (6:32) -- Subterranean blues / Randy Sabien (3:20) -- Manatee swing / Brian Torff (2:23). Sabien, Randy; Torff, Brian Q.; Magraw, Dean; and Linke, Don, "Segue (CD)" (2002). Visual & Performing Arts Faculty Music Gallery. 7.